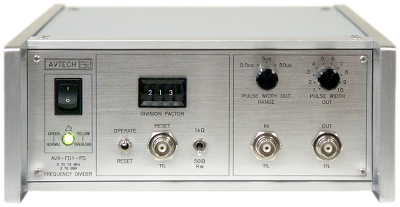 These instruments feature a simple front-panel interface and provide low-jitter frequency division. A reset input (and manual switch) provides a method of synchronizing a high-speed input pulse train with lower-speed devices on the output. TTL and ECL logic-level operation is available. Analog inputs can also be accommodated. The output pulse width of TTL-output models is adjustable.